Being one of the major reasons to implement the painting tools, sculpt is also the most advanced tool of the current paint tools. Sculpt, AKA deform paint, is a tool, with which you can deform geometry by brush strokes. Reference coordinate systems are supported, and you can paint by normals. This makes it to a very powerful modeling tool. Size, feather and depth are supported for stylus. This tool is also available as a standalone modifier named "Sculpt". Additionally, you can smoothen with this tool. 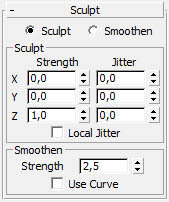 Sculpt/Smoothen: here you select if you want to use the sculpt or smoothen feature. This has been but into a single tool panel to allow a fast switching between sculpting and smoothing, as often required. If you hold the shift key while painting, you can quickly switch between sculpting and smoothing and vice versa. View: in the front view Z points upwards, x right, y backwards. If you set Z eg. to 1.0 m, you will deform all painted points 1.0 m upwards. This is the preferred mode for sculpting landscapes, where you sculpt hills and valleys just up and downwards. Screen: Z points always backwards from the screen, X right, Y upwards. If you set Z e.g. to 1.0 m, you will deform all painted points 1.0 m towards your view point. This is the preferred mode for making elevations and deepenings into an object. Parent: X,Y and Z are set according to the objects own coordinate system. This is a difference to the standard max coordinate systems, where this coordinate system would mean the parent of this object. But since you move vertices, the object itself would be the parent of the vertices. In fact, painting in object mode is exactly the same as painting in vertex subobject mode - with the only difference, that you are not disturbed by vertex ticks when painting in object mode. Local: Z points along the normal of the vertex/face/polygon. This may be either the real normal, or a line from the pivot point through the vertex/face/polygon (see parameter "Norm/by Pivot). This is the preferred mode for modeling. Grid: X,Y, and Z are set by grid. Pick: Pick a reference coordinate system from a different object. One of the major reasons for getting unwanted results is not using X,Y and Z correctly. In most cases, you should use only Z, because this is the direction, which is based on the coordinate system. X and Y are only available for special purposes, e.g. if you want to paint skewed hills. So if your'e beginning to play with the toy, use only Z. Using X,Y and Z without exactly knowing what their'e doing, may lead to strange results. Jitter X/Y/Z: In addition to the basic deform directions, you may put a random jitter on each of the directions. Local Jitter: This sets, how the jitter is added to the deformation: If switched off, all vertices, which are in the current brush stroke, get the same jitter. If switched on, each vertex gets it's own random jitter. Use Curve: This sets, if the paint falloff curve is used for the smoothing.